Optical cable, TOS/m - TOS/m, 1m. Optical cable toslink male to toslink male 1m. High quality cabel from the VALUELINE series. 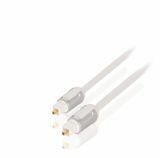 Оptical cable TOS / M - TOS / M, 1M high quality with gold plated connectors High quality optical cable with 1 m length and gold plated connectors Toslink. Optical cable TosLink/m - TosLink/m, 3m Optical cable toslink/m to toslink/m with length of 3m. Optical cable 5m with connectors TOS male, HQ Optical cable toslink male to toslink male 5m. High quality cable from the HQ series. Optical cabel, TOS/m to TOS/m, 10m Optical cable with Toslink connectors and 10 m long for digital data transfer. Optical Fiber for Lighting CK-30, 0.75mm Optical Fiber for Lighting CK-30, with diameter 0.75 mm. 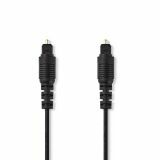 Optical cable toslink male to 3.5mm male, 1.5m, HQ Optic cable for audio signals transmission between devices with toslink input and devices with 3.5 mm input.